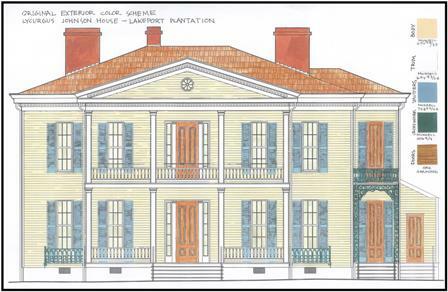 The original exterior color scheme and many interior painted surfaces have been re-created based on lab analysis of 170 historic paint samples taken at Lakeport. Historic paint analysis, led by Becky Witsell of Studio-Werk in Little Rock, has allowed us to accurately match original colors to their respective locations in or on the house. It has also enabled us to follow through with the same paint techniques originally used. The historic paint techniques found at Lakeport include marbling, graining to imitate oak and rosewood, plaster walls painted in whitewash, oil and distemper, and wood trim painted with three coats of white paint followed by a glossy clear varnish glaze to create a finish resembling fine porcelain.